◇As a result of long-term transport, will lead to battery power depletion, So remember the first time after receiving the goods charge. 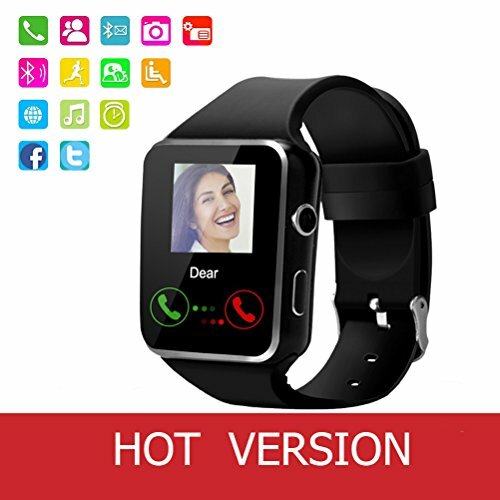 ☑ 〖Compatibility〗: The smart watch compatible with all Bluetooth enabled smartphones. All ANDROID Smartphones, Huawei, Samsung Note5, 4, 3, 2, Samsung Galaxy S9, S8 , S7, S7 Edge, S6, S6 Edge, S5, S4,Google,HTC, SONY, Xiaomi, Lenovo, OPPO,LG and other Android phones, Partially Compatible with Apple iPhone . ☑ 〖Wearing More Comfortable〗: Stylish, elegant and temperament, 1.54 inch ultra-narrow screen, 2.5D arc TP, HD display, IPS high sensitive capacitive touch screen. Surface zinc-titanium alloy plating process, precision full lamination process. Silicone material strap, anti-sweat and frosted surface treatment, ergonomic bump design, more comfortable to wear. Life Waterproof, the smart watch surface can resist rainwater impact when you are in outdooor. ☑ 〖Long-Lasting Battery Life & Lifetime Warranty〗: 380mAH lithium battery,average using time is 2 days.We also give you one piece Free Battery as a Gift. Never worry about out of battery problem to smart watch.Apart from this,Also give a protective film, a wipe lens cloth.We provide Lifetime Worry-Free product guarantee which ensure long-lasting enjoyment of your smart watch. ☑ 〖Best Gift〗: This is a stylish, full-featured, easy-to-use Bluetooth smartwatch. Suitable for men and women of all ages, is your best work-life fitness helper.It is also the best choice for gifts. If you have any questions about this product by janker, contact us by completing and submitting the form below. If you are looking for a specif part number, please include it with your message.